David Hollatz, Lutheran dogmatician; born at Wulkow, near Stargard (34 km ESE of Stettin), in Pomerania, 1648; died at Jakobshagen (24 km E of Stargard) 17 April 1713. He studied at Erfurt and Wittenberg, and became preacher at Pützerlin near Stargard in 1670, at Stargard in 1681 (in 1683 also conrector), rector in Colberg in 1684, and pastor in Jakobshagen in 1692. His principal work is his Examen theologicum acroamaticum (Rostock - afterward Stockholm - and Leipzig, 1707; 7th and 8th eds. by Romanus Teller, 1750 and 1763). The work is the last of the strict Lutheran systems of dogmatics in the era of Lutheran orthodoxy. 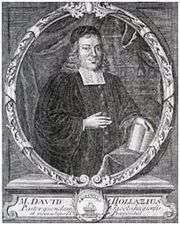 Hollatz knows Pietism, but does not mention it, although he refutes mysticism. The system is divided into quaestiones, which are explained by probationes; these are followed by antitheses, against which the different instantia are brought forward. Hollatz also published Scrutinium veritatis in mysticorum dogmata (Wittenberg, 1711); Ein gottgeheiligt dreifaches Kleeblatt (Leidender Jesus) (1713); a collection of sermons; and other works. This article incorporates text from a publication now in the public domain: Jackson, Samuel Macauley, ed. (1914). "Hollatz (Hollatius), David". New Schaff–Herzog Encyclopedia of Religious Knowledge (third ed.). London and New York: Funk and Wagnalls.